Rev Fran: "And There He Prayed." A Sermon from Littlefield Presbyterian Church on Mark 1:29-39 on the 5th Sunday after Epiphany. "And There He Prayed." A Sermon from Littlefield Presbyterian Church on Mark 1:29-39 on the 5th Sunday after Epiphany. Jesus announces that the “good news” of God’s reign has already arrived and calls people to repent and believe the good news. Then Jesus calls people to follow him and fish for people, and immediately they followed him. Then they go to the synagogue in Capernaum on the Sabbath, where the crowds were astounded at the authority of his teaching and his power to cast out demonic powers. Jesus’ fame began to spread throughout the region of Galilee. That’s where we pick up the story today. Today’s gospel lesson can be divided up into four scenes, in two settings. Scene 1. As soon as they leave the synagogue, they go to the house of Simon Peter and Andrew, with James and John. Simon’s mother-in-law is sick in bed with a fever. Jesus heals her, and she’s restored and able to serve. Scene 2. That evening, they brought all who were sick or possessed with demons to Jesus. Mark tells us the whole city was gathered around the door. Jesus cured many who were sick with various diseases, and cast out many demons. Scene 4. Simon and his companions found Jesus and said, “Everyone is searching for you.” And Jesus answered, “Let’s go on to the neighboring towns, so that I may proclaim the message there also, for that is what I came out to do.” And Jesus went throughout Galilee, proclaiming the message in their synagogues and casting out demons. Jesus’ mission is to proclaim the gospel and cast out demons and bring healing, and that’s what he was doing. People who were sick, hopeless, and desperate came to him because he offered a glimmer of hope in a hopeless and dismal world. The demanding crowds came because they wanted something... because Jesus had what they wanted most... what they couldn’t find anywhere else-- health of mind and body. Wholeness. They came for his healing touch. The demand of the crowd upon Jesus' life was great. 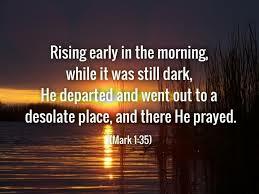 So much so that "in the morning, while it was still very dark, he got up and went out to a deserted place to pray. Jesus realized he couldn't give out to others anymore. As I was working on this passage, I remembered the instructions you get when you fly, about the oxygen masks that drop down in emergency situations. If I were flying with a child or an elderly relative or anyone needing assistance, my first instinct would be to take care of them first. But the flight attendants caution you to put on your own oxygen mask first. Otherwise, you could pass out before you have a chance to help anybody else. The whole city had been pressing in around the door-- people who were sick or possessed with demons. Jesus must have been exhausted from ministering to those who were so desperate... so needy. So, Jesus went someplace where he could be alone, away from the cries of the needy, the demands of people, the insistence that he do something. It wasn't that he didn't care about the needs of the people who sought him. Rather it was a matter of staying connected with God, so that he could maintain a clear sense of purpose. How easy it is for our lives to be cluttered with the needs and demands of others. We find ourselves going in several different directions at one time. Pastors and different kinds of caregivers often deal with people who are possessed by grief or fear or terror that will not let them go. People are struggling with addictions of various kinds, whether to alcohol or drugs or gambling or work or something else. People are suffering from mental or physical illness. Others are confused and agonizing over various issues. Some or desperately lonely. People are poor... hungry... homeless or in woefully inadequate housing. Everywhere we look, there is such pain... such need. In our families, our children, even if they're adults, need us. Elderly parents and other relatives need our care. Sometimes I wonder if we think we are the busiest people who ever lived on the face of the earth. We end up doing a lot of things, but sometimes we wonder why we don’t have more of a sense of fulfillment or accomplishment. We might feel overwhelmed…or find ourselves on the edge of burnout. As someone pointed out, burnout isn't the result of too much activity. It's the result of the wrong kind of activity. Or it can be from how we approach it. Instead of energizing and building us up, it can wear us down and sap our energy. When I read the gospels, I get the impression that Jesus couldn't have been much busier if he’d had a smart phone. Yet, in spite of his busyness and the nonstop demands on his time, Jesus knew he needed time to get away and put things in perspective...and to gain a clear understanding of God and God's purpose. When we read through the gospels, we discover that there’s a pattern in Jesus’ life. He worshipped regularly with his community of faith, and he got away regularly for time alone to pray. This is how he stayed centered in God’s love and purpose and found balance in his life. If Jesus needed to do this, how much more do we need to do it? Yes, we're busy. So busy. But when we find ourselves feeling too busy to worship and pray, we need to ask ourselves-- are we busy doing the wrong things? The images in the gospel story remind us that we need to do what Jesus did-- get away and spend time in prayer... meditate... and seek God's will. Jesus knew it would never calm down. He couldn't wait for that to happen. He set time aside to spend in prayer and meditation, very intentionally. "In the morning while it was still very dark." This sounds like something I learned when I had a young child: the only quiet time parents have is after the children go to bed at night or early in the morning before they wake up. That's when I got in the habit of staying up late to read and have my quiet time. We need to be intentional in planning our quiet time. Some folk find quiet time in their cars-- away from telephones and interruptions-- by turning off their radios and cell phones. One or two of you have shared with me that you pray for others while you're commuting to work. Others find quiet time when they walk... or in the garden, as I do. Why is this time apart so important? Look what happens here. Just as we are likely to get interrupted by a child running into the room or the clock striking or the telephone ringing, Jesus' followers who were hunting for him find him and say, "Everyone is looking for you!" Some of us are in positions--in work or family life-- where someone always has something more for us to do. If we don’t learn to stop and discern and to occasionally say “No,” we’ll always be piling on more and more things to do. Sometimes, if we’re honest with ourselves, we need to admit that it feels good to be so busy and sought after. We might feel a swell of pride rising: "Look at me! I'm important! I'm needed! They love me." We run from sunup to sundown. Chasing and being chased by responsibilities and expectations. Sometimes it can feel as if we're possessed by all the responsibilities and by our need to be the important caregiver and achiever. This morning we come to the table of our Lord. The pace is slowed. It can be for us a moment of withdrawal... a time to catch your breath. A moment to reflect upon the bread, the body of Christ... and the cup, the blood of Christ. A time for our spirits to be fed! A time for us to accept Christ's healing touch in our lives. God's love for us at this moment becomes so visible... so personal... so close... and so reassuring. We come to the Table, and God through Christ again offers God’s very self to us. Let us taste, and see that the Lord is good!